THOMPSON CLIP & SHOOT All-in-One Target Stands & Clips This innovative 2-clip design will hold your targets securely in place. Just fold the two tabs over the tab-pins and push, you're done and ready to start shooting! CLIP & SHOOT will last through 1,000's of shots Made of heavy duty, durable corrugated polypropylene CLIP & SHOOT's 18" support rods go into the hardest terrain with little resistance CLIP & SHOOT's convenient tote handle and rod-holders make it easy to store and transport complete. Durable, portable, and affordable! Dims 19.25"x15"x.5" Mfg: Thompson Target Technology Llc SPECS: THOMPSON CLIP & SHOOT All-in-One Target Stands & Clips: 19.25"x15"x.5." 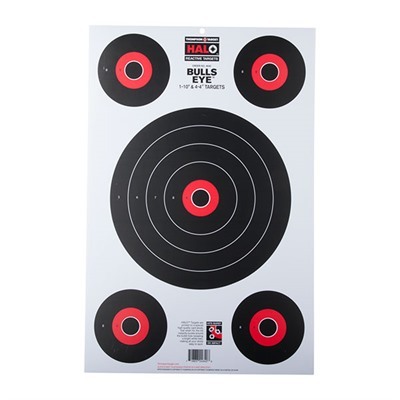 THOMPSON HALO Reactive Targets: 12.5" x 19"